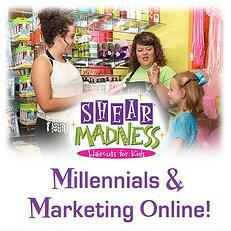 Millennials and the Importance of Marketing Online! We think the best way to prepare for future marketing trends is to study the behavior of the demographics that will soon be the dominant buying power! Our goal as a franchising system is to stay ahead of this trend, and help our franchisees create creative marketing strategies to connect to our target market now, and in the future. But this is something that applies to all businesses and their owners (who are looking for ways to be even more successful in their communities) - not just kids haircutting salons! For example, in studying our website traffic, we've seen that most of it comes in from a mobile device or smartphone. What this tells us is that our customers are likely very internet savvy, and looking for information readily available about what we offer through social media, search engines or our web site. We also understand the importance of social media marketing and reviews - as well as word of mouth marketing, which continues to be one of the best ways customers can learn about what your business offers. So how does this fit in with millennials? Between 18 and 35 years old, millennials are projected to outgrow baby bo0mers in population size by 2028. Wow! Furthermore, it's reported that millennials are spending an average of 25 hours a week online, and are using the internet to engage with others more than any other age group that came before. Plus, as around 25% of the US population is a millennial, experts are saying that at least 75% of the US workforce will be comprised of millennials by 2025! Essentially, millennials will be the bulk of your customer base over the next 10 years, with a huge amount of descretionary buying power resting in their hands. Furthermore, around 89% of millennials say that they trust recommendations from friends and family, versus claims made by a company. Remember what we said about word of mouth marketing and social media reviews? This is where that comes into play. About 44% of millennials are willing to promote, or voice concerns over products and services online through social media - with many of them saying that user generated content on a company website influences what they will or won't buy. 86% of millennials would rather read a blog written by someone to learn about a company, rather than reading an ad in newspaper or print. Pretty cool stuff. So in conclusion, Millennials are hyper connected online, but seek out offline activities with companies that create a positive experience and add value to their lives. Plus, despite ad blocking, millennials are actually more open to receiving branded messages than older generations of consumers have typically been, provided that content is targeted to their needs and interests. When millennials have a great experience with a company, they get online and share that experience on social media (via pictures or videos) with hundreds of their friends. This is awesome for a business, as they can become your number one, absolutely free marketing department out there practically promoting your busines 24 hours, 7 days a week!